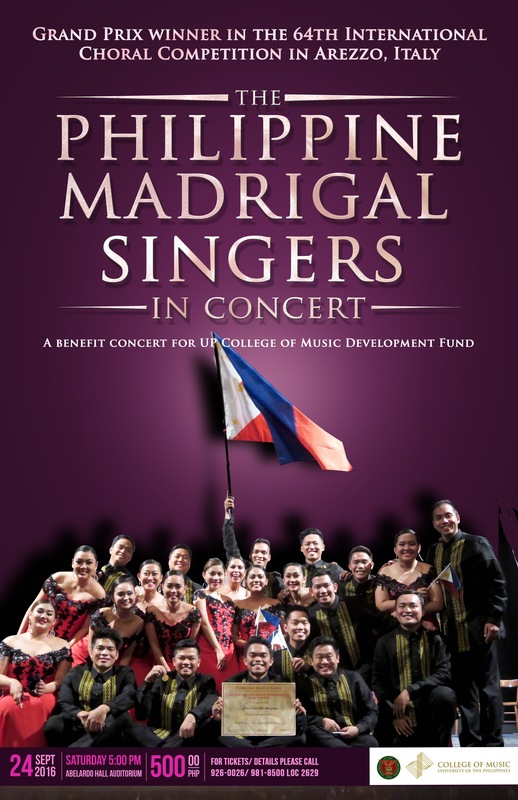 The University of the Philippines College of Music welcomes back the world-famous UP Madrigal Singers (or Madz) in an early evening concert at Abelardo Hall Auditorium on Saturday, 24 September 2016, 5PM. The concert celebrates the group’s triumphant success in their recently concluded European tour and shares their gift of music to the UP College of Music Development Fund, which was setup to financially sustain the College’s faculty concert series. The choir is under the artistic and choir direction of Mark Carpio, who has felicitously replicated the deep musicality of the group’s founder, National Artist in Music, Andrea O. Veneracion. In the concert, the UP Madrigal Singers will render some of the songs sung during their tour from June to September this year. These songs conveyed their role as Ambassadors of Peace and Goodwill, marking the Philippine Independence Day in Stuttgart, Germany; greeting the Filipino community in Dom St. Eberhand in Munich; and showcasing their repertoire in the International Festival of Organ and Chamber Music in Kamien, Pomorski and the International Choir Festivals in Szczecin, Miedzyzdroje, and in Murowana, Goslina, Poland. In that country, whose citizens are like music-loving Filipinos, the UP Madrigal Singers’ visit was headlined in the media. The choir also opened the 62nd edition of the International Habaneras and Polyphony Contest of Torrevieja, Spain. Back in 2004, the group swept all the top prizes in that competition. This year, the festival director acknowledged the group’s role in promoting and adding prestige to their festival’s colorful history. August 27. The Madz garnered almost all 1st prizes in different categories (Compulsory, Musica Sacra, and Monographic) of the contest, except the Secular Music Category, where they landed 2nd. They also garnered the Listening Committee’s Choice in the Folksong Category and the Listening and Public’s Choice in the Pop Song Category. In the Monographic Category, three works by one of its members, Ily Matthew Maniano, were featured. With these accolades, the Madz qualifies for the 2017 European Grand Prix for Choral Singing to be held next year in Tolosa, Spain. European Grand Prix for Choral Singing is the zenith of choral competitions in the world; it is a battle of 1st prize winners of Europe’s top choral competitions. To its credit, the UP Madrigal Singers holds the distinction of being the first choir in the world to win the European Grand Prix twice, in 1997 and 2007. Limited tickets to the benefit concert is 500 pesos with discounts to students, senior citizens, and faculty of UP Diliman. For inquiries, please call 926.0026 or 981-8500, local 2629.